I was born in 1939 at the nursing home in Devonport, Auckland and I am the eldest of five, 1 brother and 3 sisters. After attending Campbells Bay Primary school until the age of 10 years I then to Browns Bay Primary School as my father had purchased his own bakery in Browns Bay. After completing my primary school days I attended Northcote Intermediate and then on to Northcote College. Leaving school at an early age to work with my father in his bake house, my first wage being £2 per week and I paid £1 per week for board. I stayed at the bake house for a while before moving onto bigger and better things, driving trucks and bulldozers. I met the love of my life and got married to Diana in 1959. We went onto having 4 children together, 2 boys and 2 girls. We built our first home in Greville Road, East Coast Bays, Northshore in 1961. About 1973 we decided to sell up in Auckland and move to the Far North, buying a 147 acre farm and house at the southern end of Victoria Valley. We lived in this house for a year before we could afford to get the power on. My first job in the North was driving machinery for Laurent Construction. It was while working here that I damaged my back and spent some time at Kaitaia hospital and then in the spinal unit in Auckland. After my back injury I was unable to operate machinery so changed my career and became a porter at the Kaitaia Hospital which also involved assisting in the mortuary. This in turn led to me changing my job again and I became a funeral director for Geard’s Funeral Home. I worked there for 6 years before buying my own digger and truck, contracting around the district for a few years before going back to Geard’s and working with them for a further 6 years. I continued to work for Geard’s but as a relief worker. About 1979 - 1980, we sold the farm and moved to Kaitaia. In 1995 Diana and I decided that we wanted to work together, we took up the position as Manager of the Northerner Motor Inn in Kaitaia which we did for 3 years until Diana became ill.
Over the years we had purchased and sold various properties and ended up living at Cable Bay until we needed to sell and move back to Kaitaia to be closer to medical care for Diana. I have spent many years involved with the Far North Kaitaia RSA. I became more involved and stood for the executive, Vice President for 2 years and President for 3 years. A dream of mine was to become a pilot, I achieved this goal in 2008 when I got my pilots licence. Flying was something I really enjoyed, but in 2016 I decided to cancel my licence as I didn’t have the time to fly on a regular basis. After a long illness Diana past away in 2009. I ended up selling my house in Kaitaia and for the last 4 ½ years I have lived in my motor home travelling the length and breadth of New Zealand but it is now time for me to settle down and Back in Kaitaia with my family. I was born in Whangarei March 1951, educated at Hora Hora Primary, Whangarei Intermediate, & Whangarei Boys High Schools, before serving an apprenticeship as an Automotive Electrician. 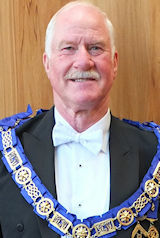 Staying, at the firm Owned by a senior Past Master & Grand Lodge Officer of my Lodge, for a period of six years, Being Initiated into Lodge Whangarei 102 in July 1973, Passed ,in Feb 1974, and Raised in Lodge Hatea, in March 1974. I went on to become Master in 1980, at the tender age of 29 yrs., a record that still stands in the 121 year history of our Lodge. In 1974 I joined the local Round Table service club, shortly afterward being selected for a Rotary Youth Leadership award, which I duly attended. 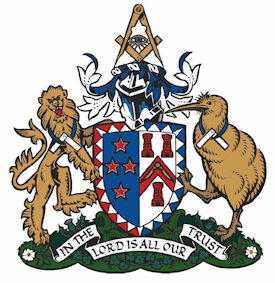 There I met my Judy my wife to be (the daughter of a Freemason from Lodge Waiheke), marrying the following year. I set up my own Business which I still run, specialising in Marine Electrical, having spent 20 plus yrs. sailing & ocean racing, 45yrs as a recreational diver, & Past Chairman of the Scientific Committee of the NZ Underwater Assn. I have a lot of experience in the marine sector. My hobbies include growing Cactus & Succulents, Diving, and Conchology (shell collecting) having one of the largest private collections in the country. 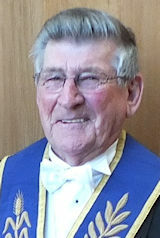 My Masonic career of over 40 yrs, the last ten as a Northland Grand Lodge Officer puts me in good position to become the D.G.M. I look forward to implementing new ideas, a fresh approach to Masonry and in particular gaining and retaining members in our District. I am very well supported by my wife Jude, a Daughter & Grandson in Te Puke, and Son in Whangarei.